Alexander Paul Antiques are always striving to make the process of choosing the right Antique as easy as possible . So we have come up with the following unique idea. Would you like to see a piece of our furniture in your home ? See if it fits before you commit to buying? If you live in England Or Wales then this new service is a reality. We believe we are the only Antiques Business to be offering this service .The service is intended for those customers who are 99% certain they like the piece but are not 100% certain of buying without seeing. What will it cost you ? If you purchase the piece or pieces you have chosen to view there will be no charge !! However If the piece is not purchased a nominal charge will apply. The exact cost would be agreed and paid by you the customer before the home viewing would take place. If the piece is purchased we will deduct the charge from the cost of the piece. 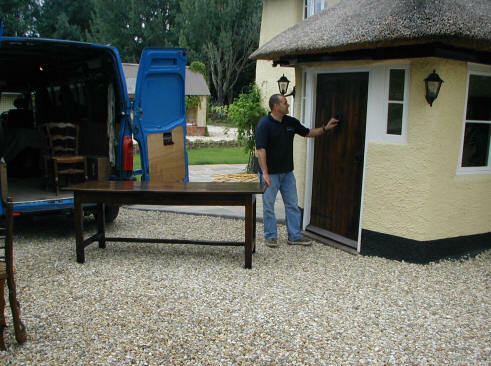 We can also arrange multiple viewings if their is more than one item you are interested in or perhaps you cannot make your mind up on two different farmhouse tables for example. If you would like to apply to view an item please email us with your name address contact information and the stock number of the item you are interested in viewing.